An important new investigative report from the Associated Press’ Alberto Arce describes the apparent ongoing activities of death squads within the Honduran police. The AP report also describes a now-infamous and disturbing video that appears to show the extrajudicial, cold-blooded murders of two young men in city streets “by masked gunmen with AK-47s who pulled up in a large SUV” – consistent with the police death squad modus operandi as described in the article. Jaime Rivera, Secretary of the Sindical de Trabajadores de Sector Electricos (STSE – Union of Electric Sector Workers) has recently returned to El Salvador from a CISPES labour solidarity tour, where he visited cities along the US West Coast to express solidarity with US workers and denounce US intervention. 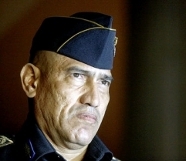 He has been active in Salvadoran labor politics for over 30 years. Jamie sat down with CISPES to speak about the Public-Private Partnership P3 law following a march to the US embassy in El Salvador to denounce its ambassador’s interference in Salvadoran public affairs. Images from the first day of the historic trial against former de facto dictator Efraín Ríos Montt and former Intelligence Director José Mauricio Rodriguez Sanchez. Ríos Montt and Rodriguez Sanchez are charged with Genocide and crimes against humanity during the civil war in Guatemala (1960-1996) against the Ixil Mayan people.